As we entered the MacRitchie reservoir park, we couldn’t help but notice the signs warning us about the resident macaque monkeys: ‘Do not feed, do not carry plastic bags, do not make eye contact, avoid wearing sunglasses.’ We began walking around the large reservoir and spotted small sunbathing terrapins sat near the sludgy shallows. They raised their pointed snouts at us as we passed. The water was still except for the small fish that dashed through the feathery algae. We hadn’t just come to see the opportunistic monkeys, though. Like Victorian explorers and ecologists before us, we were searching for the pinnacle of feathered beauty. The most impressive specimen of the local birds of paradise – the greater racket-tailed drongo. These are rare creatures which attracted the Victorian explorer Alfred R. Wallace, who was studying the variations between bird species, from plumage to beak shape. It was his curiosity and passion for finding birds of paradise, or what he called “the most extraordinary and the most beautiful of the feathered inhabitants of the earth,” that made him one of the most profilic and celebrated minds of the Victorian era. The beauty of exotic birds was highly desirable and fetched an even higher price, so many explorers, Wallace included, attempted to capture specimens to send back to menagerie displays and collectors back home. This additional venture enabled travellers the funds to be able to continue their work. Wallace was a successful field biologist, spending twelve years in jungles in the Amazon and then island hopping around the Malay archipelago. His interest was mainly in birds, and his observation that individual islands had their own unique species led him to the theory of evolution, around the same time as his contemporary Charles Darwin. You can read more about his life and accomplishments below*, but for now, let’s retrace Wallace’s footsteps into the jungle 150 years later. We stepped into the treeline and out of the sudden downpour. A shower of heat dripped down our arms as condensation. The cicadas filled our heads like tinnitus, and the flashes of sunlight through the leaves distracted our eyes from the fast flittering movements of the butterflies. Dead leaves larger than our heads were caught in rigor mortis on the large vines that swept down from the canopy in dizzying spirals. Yet there was so much life. The prehistoric-looking common mynah birds hopped before us, their movements reminiscent of two-legged raptors. Rustles in the leaves twenty feet above announced the arrival of a troupe of long-tailed macaques, lured close by a fellow walker rustling for food. Their smiles and keen eyes were not to be mistaken for friendly, and mothers with bald babies clinging to their bellies clambered down towards us. Many others watched from the branches, before leaping across the path above us to continue their hunt for food. Following the boardwalk by the water, giant ripples from bobbing catfish the length of my arm disturbed the surface. A flicker of a tongue revealed the otherwise statuesque 5ft monitor lizard, who on being discovered, plodded away on his sharp claws in search for another sunny patch to recharge. Yet we still had not found our prize: the coveted greater racket-tailed drongo birds. 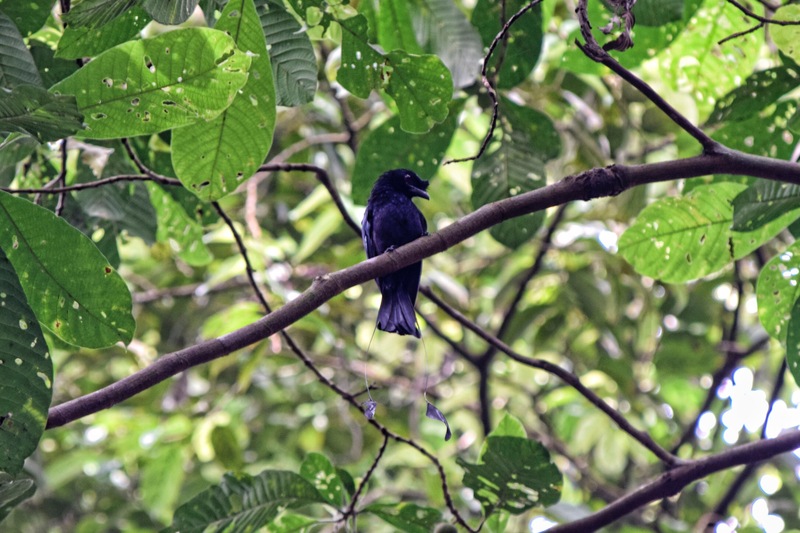 The call of a drongo is difficult to recognise since it is a master of mimicry, copying not only other birds but other animals too. 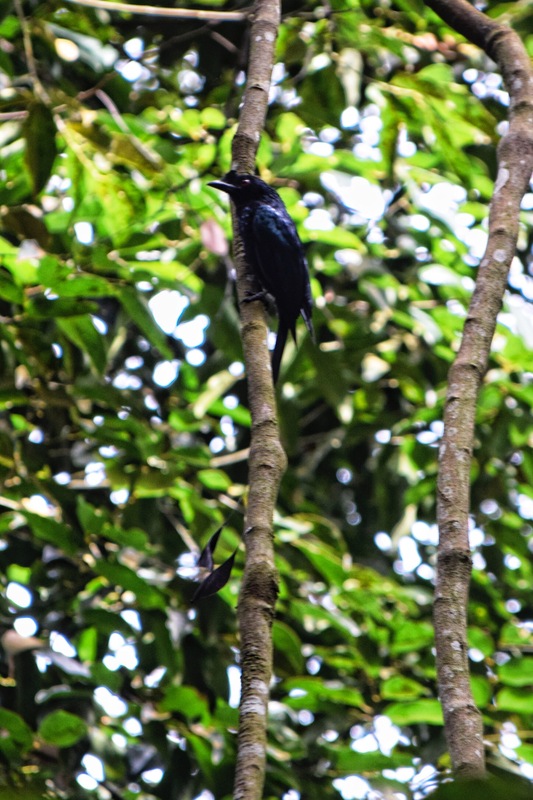 One theory behind this feature is that it enables these particular drongo birds to distract smaller birds and steal their hoard of insects – they are the pirates of the high trees. The most distinctive mark of the bird is its unique elongated tail feathers, which are shaped as delicate bows, or twirled rackets, only at the end. It hangs down from the bird at an impressive length, and seems to pose a hazard as the bird flits between dense branches. Perhaps for this reason, it mainly occupies the higher echelons of the jungle. Looking directly up at the silhouetted branches, we strained our eyes to see what was calling in a nasal whistling sound. The speckled leaves exposed pinpricks of light, having been ravished by hungry insects. It was then I saw it. A medium-sized bird, unremarkable in colour with its black/blue feathers that reminded me of blackbirds in my native England, but with a show-stopping finalé. The long tail swept behind it before settling down gracefully below its owner. The tufts of its crown moved as the bird surveyed its surroundings. These drongos are well-known for their bravery on taking on larger birds in competition for food, and it was likely searching for an easy meal. It was a magnificent sight, and the experience only lasted half a minute. Yet the appeal of seeing these birds has lasted centuries. Back in England, in haste to publish these significant findings to the scientific community, it was agreed that Darwin and Wallace would publish their theory of evolution in a joint paper in August 1858. At the time, Wallace was still out in the field, suffering with fever in New Guinea and did little to celebrate his success. On his return to England, however, Wallace was awarded with the Order of Merit, the highest honour bestowed by any monarch. His travel memoirs, The Malay Archipelago was published in 1869 and has never been out of print. Although Wallace published subsequent books on his theory, it was Darwin’s book in 1859, On the Origin of Species, that ignited the imagination of the public. The evolution argument fell out of favour towards the end of the 19th Century, and on its revival in the 1930s, it was Darwin who received the sole credit. However, on the centenary celebrations of Wallace in 2013, a portrait was hung in the Natural History Museum in London to commemorate his achievements, albeit dwarfed by the impressive marble statue of Darwin seated on the stairs. Finally, in 2015, the first full bust of Wallace was presented to the Linnean Society, where his joint paper on evolution was first read in 1858.